So, vacation took place during the Halloween season. 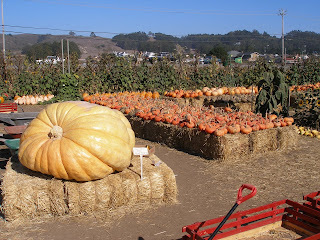 Half Moon Bay is known for pumpkins. 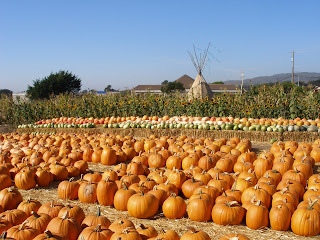 Nothing made more sense than to buy some pumpkins for Halloween in Half Moon Bay. 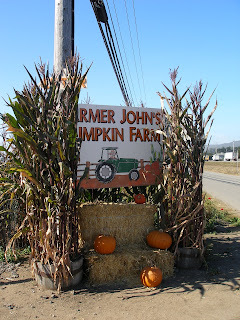 The pumpkin patch I went to was Farmer John's Pumpkin Farm located off Cabrillo Highway (Hwy. 1). 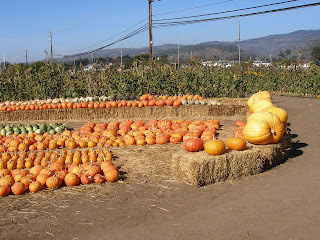 Myself, my boyfriend and his family had lunch at the Half Moon Bay Brewery and then we went to get our pumpkins at Farmer John's. I'd never gone to a pumpkin patch before to get a pumpkin at Halloween, so was really looking forward to this visit. It wasn't quite what I expected, though. 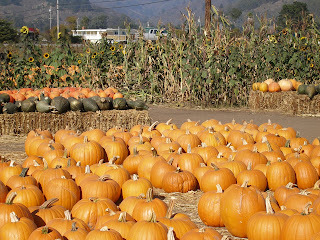 I had expected to walk down rows of pumpkins growing on vines, but as you can see from the pictures, the pumpkins were already picked (harvested?) and grouped together. Despite my disappointment at not getting to pick a pumpkin straight from the vine...I enjoyed looking at all the pumpkins and finding that perfect pumpkin. 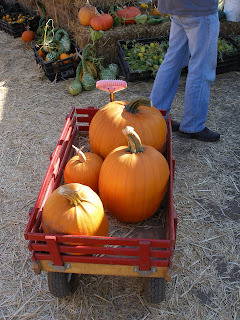 We purchased several pumpkins, which seemed to be sold based on estimates from Farmer John. However, since we had several quite large ones, the pricing was fairly reasonable. Of course, the whole point of buying pumpkins at Halloween is to carve them. So we did. This is my pumpkin (above). 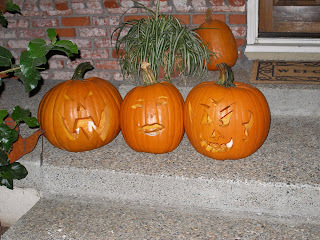 Below are the pumpkins lit on the porch at night.